Graphic designer Diana Thornton and mastering engineer Mike Hogan have partnered to create CRESCENT CITY DUPLICATION to provide top quality CD/DVD duplication, audio mastering and graphic design to the region’s entertainment industry. Although the company is new, the services and expertise provided by Diana and Mike are well regarded in the region. They have been providing design, mastering, and disc manufacturing for over 15 years for clients like Ellis Marsalis, Louisiana Philharmonic Orchestra, Irvin Mayfield, The Continental Drifters, Mulebone, Louisiana Red Hot Records, Sound of New Orleans, and many others. Diana is the founder of Crescent Music Services and an award-winning graphic designer. Mike is one of New Orleans’ long-time audio mastering engineers with his company Necromancer Digital. Together they form the ultimate resource AND they are both musicians and know the entertainment industry well. Mike will be handling day-to-day operations from his Mid City mastering studio and Diana will be providing her design services and expertise. Crescent City Duplication is the New Orleans-based sister company to Crescent Music Services founded in 1997 by Diana Thornton and Mike’s Necromancer Digital mastering services. Crescent City Duplication will focus on small duplication runs. 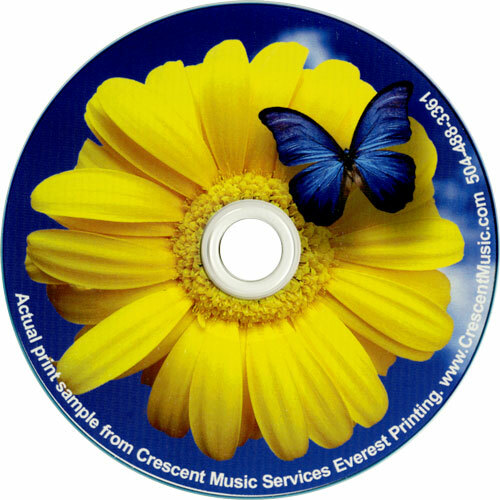 Crescent Music Services will handle full manufactured projects. Coupled with Mike’s mastering and Diana’s design, between the three companies, you can get mastering, design and discs – 50 discs or 50,000. Crescent City Duplication is now open for business and can duplicate your discs fast. Call 504-264-3321 today for duplication, design and mastering. Fast, good and local. This entry was posted in News and tagged cd duplication, Disc Duplication, dvd duplication, DVD Shortruns, New Orleans CD Duplication. Bookmark the permalink.